William Hernández is the Focusing Coordinator for Ecuador. 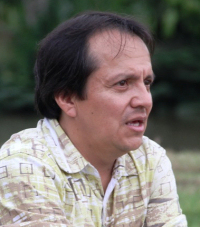 He has been the Executive Director of FECD, a development organization whose mission is to improve in a sustainable manner, the living conditions of the most vulnerable groups in Ecuador. For the last three years William has worked in the development of the FSL (Felt sense Literacy) project with Gene Gendlin and Mary Hendricks. He has developed the Human Social development model with “Focusing through the Pause”. The implementation of the PAUSE workshops in various vulnerable communities in Ecuador have significantly contributed in reducing community tensions, family violence and have empowered people to find their own voice. The introduction of ‘Focusing through the Pause’ into the Development process has provided a more humanized model for building economic prosperity and wellness by attending to internal and external change. William talks about the transformational power the "Pause" in this conversation. This month’s conversation is very different from the others. To tell you how different, I’m going to use the “good news, bad news” format. Starting with the bad news: It’s more difficult to follow than other conversations, partly for technical reasons (the recording is not as crisp as most others have been). Partly also because, in order to overcome the language barrier, we had an interpreter translating in each direction. Now, the good news is that it is really worth it to go through these difficulties to actually listen to the conversation. Because it is about another approach that is both true to the spirit of Focusing, and at the same time boldly opening new horizons. Suffice it to say that Mary & Gene Gendlin have been very excited about the Felt Sense Literacy initiative during the past few years, and involved in its development. So this is not just a conversation among many. This is the beginning of an ongoing project within the Focusing community.